The Republican bill is really unpopular — and now Trump’s numbers are falling, too. President Trump raises after a rally at the Kentucky Exposition Center on Monday in Louisville, Kentucky. House Republicans introduced their health care bill, the American Health Care Act, only two weeks ago. During that relatively short interval, President Trump’s approval ratings — which were never very good — have become a little worse. Is that just a coincidence? Could health care be Trump’s undoing when so many things haven’t been? Let’s ask a few more questions about Trump’s popularity and the GOP’s health care plan. The health care bill probably has had a drag on Trump’s numbers, but it isn’t an open-and-shut case. How popular is Donald Trump? We have a handy interactive to answer that very question. 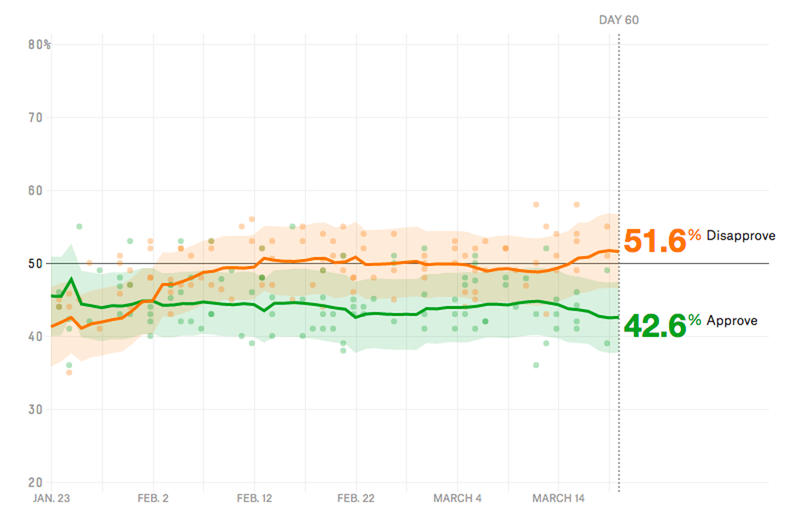 Rounding to the nearest whole number, Trump has a 43 percent approval rating and a 52 percent disapproval rating, according to our polling average. That isn’t a good score compared to where past presidents stood at this point of their presidencies. George W. Bush had a 55 percent approval rating and a 27 percent disapproval rating at this point in his term, for instance, using the same method that we use to calculate Trump’s ratings, while Barack Obama had a 59 percent approval rating and a 32 percent disapproval rating. But while Trump’s numbers aren’t good, they aren’t necessarily catastrophic, either. Trump won the election last November even though only 38 percent of voters had a favorable impression of him in the national exit poll. The circumstances behind that victory were quirky — coming partly because Trump had a not-very-popular opponent in Hillary Clinton and partly because of the Electoral College. Nonetheless, neither Trump nor his opponents should take very much for granted. But what about that Gallup poll? Aren’t Trump’s polls cratering? On Sunday, Gallup published a poll showing Trump’s approval rating falling to just 37 percent, and his disapproval rating rising to 58 percent — the worst numbers they’ve shown for him so far. These results drew an awful lot of attention from journalists in my Twitter feed. But they’re something of an outlier. Gallup has generally had low ratings for Trump. And their polls have been fairly “bouncy” as compared to those of other polling firms. That isn’t necessarily a bad thing,1 but it’s important to keep in mind for context. For instance, Trump’s net Gallup approval rating improved by 9 percentage points from Feb. 16 to Feb. 22, even though it was flat in other surveys. And it improved 5 points from Sunday’s edition of Gallup’s poll to Monday’s. Individual polls — and Gallup’s especially — can be noisy. The bottom line is there’s not much reason to cite individual polls as compared to the polling average. But Trump’s numbers are getting worse in the average, right? Yeah, they probably are. Other polling firms haven’t shown the massive drop-off that Gallup has. But pollsters from Rasmussen Reports to Ipsos to Fox News have mostly had Trump moving in the wrong direction. Over the past week or two, Trump’s approval ratings have declined by about 2 percentage points in the FiveThirtyEight average, while his disapproval ratings have climbed by about 3 points. On average, just 30 percent of voters favor the GOP bill, as compared with 47 percent who oppose it. By comparison, Obamacare had a 40 percent favorable rating and a 49 percent unfavorable rating when it finally passed Congress in March 2010. Later that year, Democrats lost 63 seats in Congress, in part because of the health care bill’s unpopularity. But while Obamacare polled poorly, the numbers for the Republican bill are quite a bit worse. It’s also the case that a fair amount of the public doesn’t yet have a firm opinion of the GOP bill. In theory, that might represent an opportunity for the GOP to improve the bill’s perception. But the experience of Obamacare suggests the AHCA’s polling may get worse before it gets better. The earliest polls on the Democrats’ health care bill, in the spring and summer of 2009, found the public about evenly divided on it, although with a lot of voters undecided. The vast majority of undecideds turned against the bill, however, as it went through months of congressional infighting. With no clear path forward for Republicans — any bill that could pass the House right now probably won’t pass the Senate without significant alterations — they could be in for the same fate. A couple of those health care polls seemed weird. What’s up with that Morning Consult poll? Unlike the five surveys that showed the Republican bill to be unpopular, Morning Consult’s poll for Politico last week found a plurality of respondents in favor of it. But there’s an important difference in their poll. As the Huffington Post’s Ariel Edwards-Levy points out, the Morning Consult poll didn’t describe it as a Republican bill, instead referring to “a proposed health care bill in Congress called the American Health Care Act.” That’s probably not informative enough given that the bill’s formal name is fairly obscure to voters. Without including the Morning Consult poll in the average, approval for the GOP bill drops to just 27 percent with 49 percent disapproving. Still, we’d rather wait for more good polls to come along than to kick the ones we have out of the sample. We’re continuing to monitor the health care polling and should have a more comprehensive review of it for you soon. I’m still not totally convinced. Why are you so confident that health care is hurting Trump? I’m not totally convinced, either. We can observe when a president rises and falls in the polls, but it’s not always easy to say why. Still, there are lots of reasons to think that health care is a liability for Trump … even in a political climate where people have often been too quick to predict Trump’s demise. One factor is that we know health care policy can cause big swings in public opinion. In 2009 and 2010, for example, the debate over the Democrats’ health care bill coincided with a sharp decline in Obama’s popularity. From when then-Speaker Nancy Pelosi introduced the House version of the Democrats’ bill in July 2009 to when the Affordable Care Act eventually passed in March 2010, Obama’s approval rating declined by roughly 10 percentage points, while his disapproval rating increased by about 10 points. 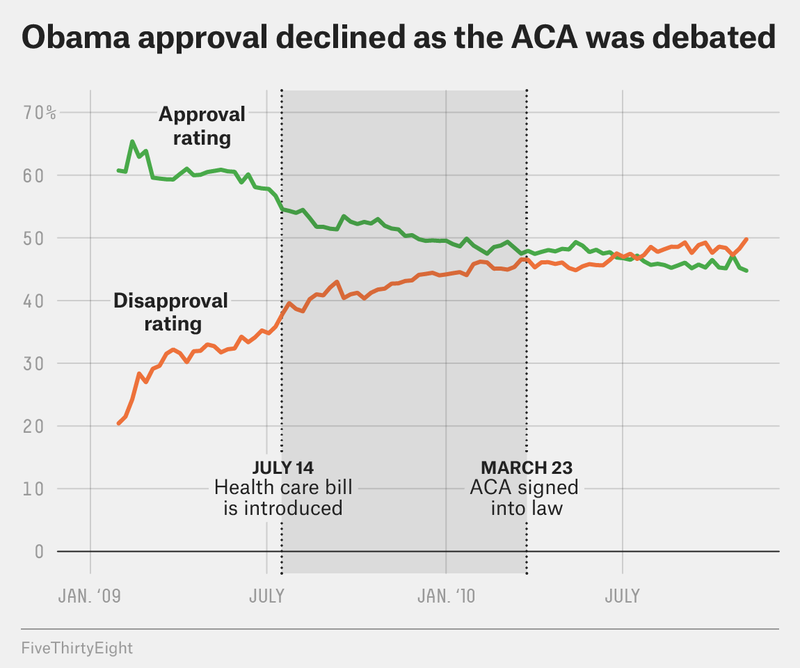 Perhaps the timing was just a coincidence and Obama’s numbers were bound to decline anyway, but his ratings worsened at a faster rate during the health care debate than before or after it. There’s also the problem that Trump risks having overpromised and underdelivered. Polling and focus groups suggest that while voters have lots of problems with Trump, they generally trust him to get things done and keep his promises. On health care, Trump has painted himself into a corner. Trump promised to repeal Obamacare, but he also promised a replacement that would provide “insurance for everybody.” However, the number of uninsured people would rise by 24 million people by 2026 under the GOP bill, according to the Congressional Budget Office’s estimates. Furthermore, some of the bill’s greatest impacts — in terms of lost coverage, decreasing subsidies and more expensive premiums — could be felt most acutely by the very older, rural voters who supported Trump in large numbers. Finally, there’s the matter of intensity, where there’s a massive advantage for Democrats. Some 72 percent of Hillary Clinton voters strongly oppose the GOP’s health care bill, according to the YouGov/Huffington Post poll, while only 13 percent of Trump voters strongly support it. That makes health care a lot different than the typical issue on which partisans are equally riled up on both sides. And it could create problems for Trump and the GOP down the road. Town halls around the country will continue to be rowdy, for instance, while a high Democratic turnout could offset some of Republicans’ traditional demographic advantages at the midterms. But can we trust these polls in the first place? Oh, this argument again? It’s certainly possible to overestimate the precision of polling. If your fate depended on whether Trump’s approval rating was really 40 percent or 43 percent or 46 percent, for instance, you’d want to take out a life insurance policy. And there are inevitably lots of ways to misinterpret the polling. During last year’s election, a lot of national media outlets mistakenly concluded that the Electoral College would help Clinton. That finding wasn’t supported by the polling, which instead suggested the Electoral College would benefit Trump. But overall, the polls were about as accurate as they’d been historically, with Trump beating his national polls by only 1 to 2 percentage points and his swing state polls by 2 to 3 percentage points, on average. And when the polls are wrong, it isn’t necessarily in the direction that you’re hoping for, or expecting. In 2010, Democrats predicted that Obamacare would immediately become more popular upon its passage. Its numbers didn’t improve, however, and neither did theirs — instead, Democrats’ position continued to worsen down the stretch run of the midterm campaign, leading to their 63-seat drubbing in the House. Trump and Republicans have every right to cross their fingers and pass a health care bill, as Democrats did. But they can’t necessarily defy their electoral fate. People often underrate the amount of variation in polls that will occur due to sampling error alone. That is, it takes a few days before the impact of the bill will be reflected in polls as the public begins to digest the legislation, and then a few more days before those polls are completed, published and included in our polling average.